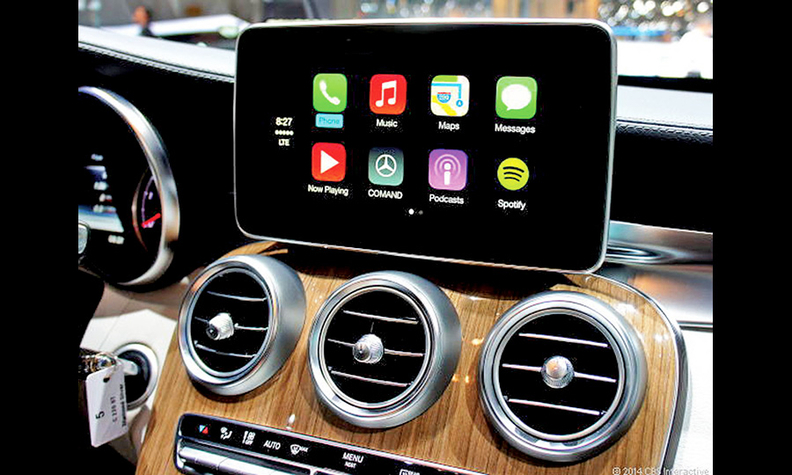 Apple's hands-free iphone system CarPlay runs using Blackberry's QNX software. TORONTO (Bloomberg) -- BlackBerry says it's determined to keep its lead in connected-car software, even though its share of the global smartphone market has tumbled below 1 percent, crushed by rivals Apple and Google. The Canadian company's QNX operating system, used to power its BlackBerry 10 phones, has become the technology of choice for mapping, communication and entertainment systems in cars from Ford Motor Co. to luxury German brands Porsche and BMW. "QNX is one of the more, if not the most valuable, assets in the company right now,“ said Mark Boyadjis, a U.S.-based analyst at IHS Automotive. The company is looking for a larger slice of the connected-car market as sales of smartphones continue to slide. Revenue last quarter probably slumped 58 percent from a year earlier, according to analysts' predictions. QNX, which accounts for an estimated 2 percent of BlackBerry's sales, faces its own challenges: The connected-car market, predicted to reach $53 billion in 2018, is also coveted by Apple and Google. The market for technology that links cars and smartphones was worth $18 billion in 2012 and will jump more than threefold in 2018, according to GSMA, a global association of wireless carriers. The world's biggest technology companies are turning their design efforts to connected cars as smartphone growth rates slow. Apple introduced the CarPlay platform this month at the Geneva auto show, where Ferrari, Mercedes-Benz and Volvo showcased the technology that enables hands-free use of an iPhone. Inside the car, Apple and BlackBerry are collaborators rather than rivals. QNX software allows CarPlay to recreate the iPhone experience on the console's screen, with icons familiar to iPhone users, including "Phone," "Messages" and "Maps." "I've never thought of us as a competitor," Derek Kuhn, QNX's vice president of sales and marketing, said in an interview. "We have been working with Apple for many years." Tara Hendela, a spokeswoman for Apple, declined to comment. The iPhone, introduced by Apple in 2007, was the first threat to BlackBerry smartphones. Then came devices running on Google's free Android operating system, which now dominate the global smartphone market. Google is now trying to replicate its phone success with cars. On Jan. 6, the company announced the creation of the Open Automotive Alliance with Audi, General Motors Co., Honda Motor Co. and Hyundai Motor Co.
Mary Chan, president of GM's Connected Consumer unit, said in a statement on Jan. 6 that the carmaker saw "huge opportunities" for Android to pair with its OnStar car communications and tracking system. OnStar, however, relies on QNX for alerts in emergencies and for hands-free operations. "It's a classic Silicon Valley situation -- one day you're a collaborator, another day you're a competitor," said Boyadjis. Google poses a bigger threat to QNX, according to Boyadjis, as more carmakers adopt the Android operating system. Kia’s Soul and the Mercedes SLS AMG are among the first vehicles that now run Android, he said. Kuhn said Google and QNX have been collaborating for many years -- including on the integration of Google Earth into Audi cars -- and remain partners. Christopher Katsaros, a spokesman for Google, declined to comment on its relationship with QNX. BlackBerry CEO John Chen, who took over in November, signaled his intention to transform BlackBerry into a service provider when he struck a December deal with Foxconn Technology Group, the Taiwanese electronics manufacturer. Outsourcing design and production will free up resources for software development. Shares of BlackBerry have climbed 23 percent this year as investors warmed to Chen's vision of a company focused less on touchscreen phones for consumers and more on devices for businesspeople and government customers, as well as software. Still, the stock is down almost 95 percent from its 2008 peak. BlackBerry will report fiscal fourth-quarter earnings on Friday and analysts are predicticting a loss of 57 cents a share, excluding some items, on sales of $1.11 billion, the average of estimates compiled by Bloomberg. The company doesn't break out revenue for the Ottawa-based QNX unit. Boyadjis estimates QNX will generate about $100 million in revenue this year, about 90 percent from the auto industry. Boyadjis assumed an average software license of about $3 per vehicle and QNX selling 20 million units. Like Microsoft, QNX got its start on a college campus. A year or so after BlackBerry inventor Mike Lazaridis enrolled at the University of Waterloo in Canada in 1979, two fellow students, Dan Dodge and Gordon Bell, developed the first version of QNX in the southern Ontario town. They relocated to the Ottawa area, Canada's emerging tech hub at the time, and released the first commercial version of QNX in 1982. One of QNX's biggest-selling points is that it's a microkernel-based operating system -- meaning it has multiple layers or servers that keep operating even if one is shut off or freezes. Stability is indispensable in environments where a server crash could be fatal, and QNX won contracts with the U.S. Army's unmanned Crusher tank and nuclear power plants operated by Atomic Energy of Canada Ltd. In April 2010, BlackBerry, known then as Research In Motion Ltd., or RIM, bought QNX for $200 million from Harman International Industries Ltd. Bloomberg News reported in August of that year that RIM was using QNX as the operating system for its first tablet computer to challenge Apple's iPad -- and then for future phones. QNX continues to make inroads with automakers. Ford Motor Co. last month dropped Microsoft's software for QNX in its Sync car system, according to two people familiar with the shift. Ford would be an addition to a client roster that includes Chrysler, Hyundai and Jaguar Land Rover, as well as most luxury German automakers. "QNX is the standard right now," said Matthew Stover, an analyst at Guggenheim Partners in Boston. "It's proven and people know what it is." A key to maintaining the lead is QNX's track record in running safety systems, crucial in situations where a software freeze could mean a car accident. "That advantage will help carry them as they fight the titans Google and Apple in the future," said Boyadjis.